As the grueling 18-race Pirelli World Challenge (PWC) season heads into its final rounds, the Buford, Georgia-based Kia Racing team faces a challenging West Coast swing for rounds 13 and 14 at Miller Motorsports Park in Tooele, Utah, August 21-23 and rounds 15 and 16 at Sonoma Raceway in Sonoma, California, just four days later. On top of the logistical difficulties of operating 2,000 miles away from their home base for back-to-back races, the vast differences between the two road courses pose an additional challenge to the team. In addition to considering variables related to track lengths and configurations, the engineers must also factor in Miller's 4,400-foot elevation and the "atmospheric correction" required by PWC rules for Kia's turbocharged Optimas. "At higher elevations the air density is much different than at sea level, and our turbocharged engines have an advantage because they are less impacted by the thinner air than are the normally aspirated engines of our competitors," said Russell Smith, team owner, Kinetic Motorsports. "To keep the playing field as level as possible, the series officials have written an 'atmospheric correction' factor into the rule book, which is a formula that lowers our turbo boost in proportion to the barometric pressure at any given track. The challenge is that we have to get it absolutely right. If our cars over-boost at any point during the race weekend, our times would be disqualified for that session, so the stakes are pretty high." As the rest of the team is busy calculating altitude adjustments and attempting to pack every conceivable tool and spare part they could need during their cross-country trek, Kia Racing driver Ben Clucas, pilot of the No. 36 DonorsChoose.org Optima turbo, is preparing to make his first start at Miller. Contrary to Ben, teammate Mark Wilkins, in the No. 38 B.R.A.K.E.S. Optima turbo, is ready for his second visit to Tooele, where last year he narrowly missed out on the driver championship during the 2014 season finale. Wilkins scored pole position in qualifying for the penultimate round but suffered a broken axle at the start of the race that took him out of contention. Thanks to his successful season to that point, however, he hung on to finish third in the GTS Driver Championship, and Kia went on to win the 2014 Manufacturer Championship. In addition to the factory-backed GTS Optimas, Kinetic Motorsports' trio of privately entered Touring Car A (TCA) Forte Koups will be facing a back-to-back challenge of their own at Miller. TCA points leader and defending driver champion Jason Wolfe and teammates Kris Wright and Samantha Tan visit Tooele just one week after Wolfe scored two wins behind the wheel of his No. 36 Richard Wolfe Trucking Kia Forte Koup at Mid-Ohio Sports Car Course. 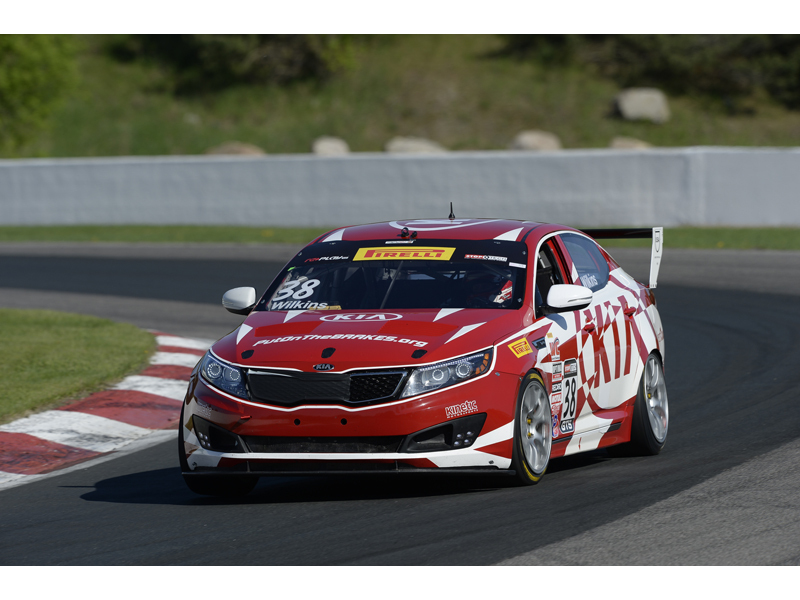 Both GTS Optimas and all three TCA Fortes will stay on the West Coast for their respective season finales, which are scheduled for September 11-13 at Mazda Raceway Laguna Seca in Salinas, California. GTS round 13 of the PWC at Miller Motorsports Park takes place Saturday, August 22, at 5:10 p.m. ET. Round 14 begins Sunday, August 23, at 11:45 a.m. ET. Tape-delayed televised coverage of the GTS doubleheader weekend will air on the CBS Sports Network (air date and time TBA). TCA round 13 at Miller Motorsports Park takes place Friday, August 21, at 1:40 p.m. ET, followed by round 14 on Saturday, August 22, at 10:30 a.m. ET and round 15 at 6:30 p.m. ET. GTS round 15 at Sonoma Raceway takes place Saturday, August 29, at 4:45 p.m. ET, followed by round 16 on Sunday, August 30, at 11:40 a.m. ET. Live-streamed coverage of all PWC races is available online at www.world-challengetv.com, and race fans can keep up-to-date with the Kia Racing team via the Kia Motors America Facebook and Instagram pages, and on Twitter @Kia.